Listening to General Conference while making something good to eat. 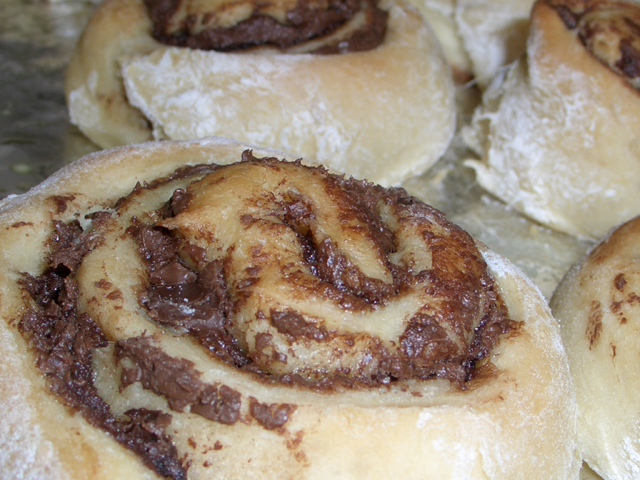 Today it was chocolate sweet rolls, courtesy of the September issue of Better Homes and Gardens. The recipe can be found here. I changed it slightly since I had no coconut, but I added chocolate chips instead. All my other Favorite Things today are Wes-related. No mention of John or Zumba anywhere, but you know I still love them. 1. Wesley playing Flip the Burp Cloth. I don’t know why this entertains him so well, but it does. For a half hour, sometimes. 2. Wesley talking to himself. He’s getting more and more vocal. No real words, but sounds. Lately when I give him a bottle I say, “Do you want mmmmmmmilk? Say ‘mmmmmmmilk. '” And he really concentrates and tries to make the sound! Usually when I say, “Mmmmmmmilk” he says, “Ba!” But still, it’s a sound. And sometimes he makes the “mmm” sound. 3. Safety locks on the cabinets. I hit a breaking point last week and bought child proof locks for our kitchen cabinets. I. Love. Them. The next video demonstrates something I’ve been working on with Wes a lot lately: feeding himself with a spoon. At home I put my hand over his to help him keep his grip. Teaching him to feed himself requires more time and patience from me, but he actually eats more because he’s “doing it himself” (even though I’m helping). Today I was listening to Wes eat some crackers and I found myself enjoying hearing him eat. And I thought to myself, “That’s weird; why would I find listening to Wes eat crackers so enjoyable?” Then I realized it’s because I can HEAR him crunch his crackers. Which means that he has teeth! Wes didn’t get his first tooth until he was 19 months old, and his molars only started coming in only last month. We gave Wes crackers (the kind that dissolves easily) long before he had teeth. So I was used to him gumming his food, which is silent. Now that he has teeth he can crunch! If you’ve seen the 2008 BBC film version of Jane Austen’s Sense and Sensibility, doesn’t Wesley’s crunching sound remind you of Henry (the spoiled red-headed boy) who’s eating cheese puffs near the start of the movie? wow, he got his own pot pie. impressive. :) it’s fun to watch him with a spoon.